The cliché that “talking is better than not talking” Is correct most of the time. Where it fails, however, is in the face of gross incompetence. It was and is absolutely for the best that North and South Korea were talking. The Panmunjom summit and declaration constituted an epic moment in history. But Trump’s actions have threatened that historical moment. South Korean President Moon Jae-in was careful to make no concessions to Kim, and rightly demanded none. There were symbolic moments and declarations of good will that could be built upon. Then Trump came in. By even meeting with Kim, he gave the North Korean leader something he and his predecessors had wanted since the cease-fire in 1953: their rule being legitimized by a meeting with a US president. But this might have been acceptable to get potentially game-changing diplomacy rolling. And it might still have worked out until Trump decided to announce the suspension of what he called “war games.” That he did this without any consultation with South Korea or even the Pentagon was a horrible misstep, and one that has been unduly downplayed. South Korea correctly does not want to get into a tussle with Trump over this. They recognize the progress they made (without giving away the farm) and very much want to keep it and make more. While Trump’s unilateral declaration complicates that, a public split between Moon and Trump would make it much worse. But Trump was played by Kim, and it was both a step backward and an unnecessary episode. 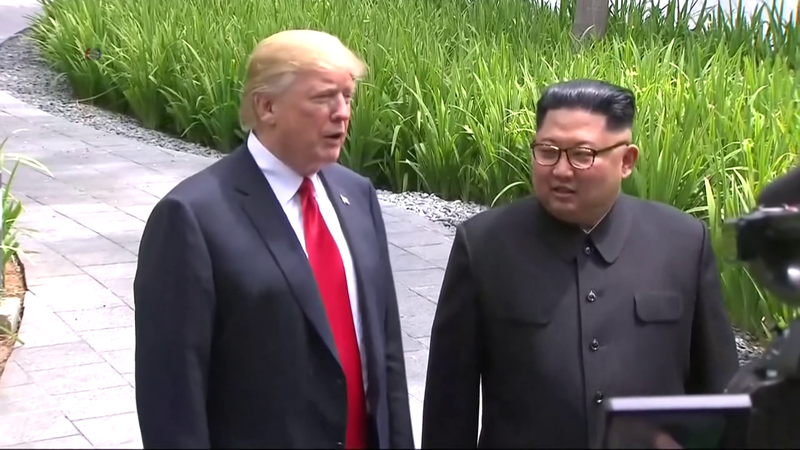 The South was doing fine with Kim and, while they need to coordinate with the US to take more big steps with the North, they do not need Trump grandstanding, pumping Kim up and making unilateral concessions with no regard for the South’s position. Moon has tremendous public support in Korea for his diplomacy. Trump’s over-extension risks undermining that support. More conservative elements in the South will pounce on a renewed split between the US and the North to press their case that Moon moved too far and too fast and to start to cast doubt on Moon’s efforts. Trump should not be coddled for his actions. When he claims he eliminated the threat of war with North Korea, we need to remind everyone that he escalated that threat from a background simmer to “fire and fury.” We need to remember that it was Trump’s irresponsible rhetoric that pushed Kim to dash toward a nuclear weapon. Trump doesn’t deserve credit for moving us away from the extreme risk of war to a place that is still much more dangerous than the one we were in when Trump started. Trump’s decision to meet Kim did absolutely nothing that Moon had not already accomplished. All it did was elevate Kim’s status, and let Kim know that he can get the US to act without consultation with the South (which, after all, is the party that should, can, and ultimately MUST lead this effort if it is to succeed) by flattering Trump. The suspension of the military maneuvers is, in the end, no big deal, but the symbolism, and the off-hand way Trump took this action—clearly without recognizing the magnitude or the potential consequences of his actions—meant a great deal more. Unfortunately, the Democratic leadership in Congress played this all wrong as well. Rather than showing themselves to be smarter, to be more thoughtful and mindful, they acted in almost the exact same way as Republicans did regarding Iran. That was a horrible misstep. Trump is a bungler who refuses to accept being well-briefed on an issue, preferring to “touch and feel” and guess his way through. He has made mistakes great and small already in his foreign policies. By contrast, Barack Obama made a thoughtful, strategic, and well-planned decision to pursue a nuclear deal with Iran. Whether people agree with that decision or not, it was nothing like what Trump did here. The two should not be treated as equals, yet that is exactly the message the Democrats sent. As with the new Supreme Court opening, they said “we will do what Republicans did under Obama.” The difference is that with the Court opening, it’s the right—indeed, the only—thing to do. With Korea, it was not. With any other president, even hawkish ones like George W. Bush, the axiom that talking is better than not talking is generally going to be true. But when the president is as grossly uneducated and incompetent as Trump, it may not be so. President Moon was doing well. The Singapore summit, in the kindest light, did nothing to build on Moon’s work. More realistically, it set the dialogue back and set up a situation where the US will be incentivized to return to its belligerency, as more reports of Kim’s unwillingness to become the next Qaddafi surface. Talking is always better than shooting, to be sure. But in order to make sure we don’t devolve into shooting, the conversations that need to be encouraged are those between Kim and Moon. Trump needs to be carefully managed so he doesn’t continue to screw things up. Ah Trump. Watch his body language. 1) The turn, frown and defensive uptilt of his chin as he refuses to speak to the press. 2) THE CONSTANTLY CROSSED ARMS AS HE SHRINKS DOWN AND HUGS HIMSELF. 3) The clown smile that he holds for 10 seconds and turns back and forth to make sure the whole room sees, usually at his sweaty worship-rallys, where he can lie with impunity and feel waves of love. Is Donald so insecure and unloved that he’s willing to sell the free world to Putin for a pat on the head and a billion dollars?